Happy New Year Friends!! With 2018 having just starting three weeks ago I've had a lot of time to sit down and think as to what my 2018 goals would be and I thought why not share some of them with you! I made realistic goals that I knew I could accomplish and to have them be very important, rather than just silly ones like stopping eating reese's, because we all know I can't do that nor want to haha. 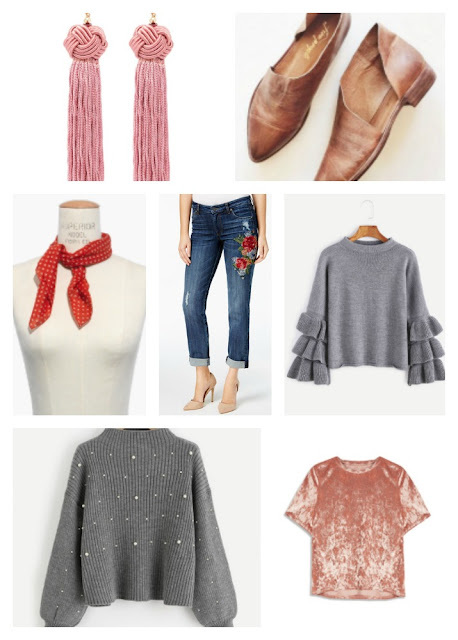 Now for my favorite style items for 2017! There were a couple of trends that I really didn't like, such as fur sandals, but there were definitely more that I loved than disliked! See my favorite below! I feel like all seven of these items were pretty big in the fashion community. I think my all time favorites were actually the accessories: bandanas and tassle earrings! They just complete an outfit! I did love the velvet, but I did feel like it depended on the article of clothing and what it looked like. The ruffle phase was the same too, but more of where the ruffles were and how big they were. I think embroidery apparel was big this year, and I think it started in 2016 but I loved the embroidery shirts, dress, pants, you name, this was a big trend in 2017! Having pearls on clothing was also one of my favorites (even though it came late in the year) I thought it very fun and almost elegant! As for shoes, I loved the "Royale" Pointy Toe Flat! I have never seen shoes like this before, and at first I was a little hesitant, but once I saw and tried them on, I completely became in love! So those are my favorite fashion trends of 2017! What were some fashion trends you absolutely disliked or loved? Tell me in the comments!